Four months ago I had never heard of the Haida Gwaii Indian nation, nor had I been anywhere within 700 miles of this beautiful place. However, thanks to Walt Salmaniw and his gracious wife Wanda (a native Haida, as it turns out), this DXpedition was the most memorable ever--as much or more so for the memories of food, friendship, and hospitality than for the Dxing itself. Meeting top local Haida artists, touring the new and expansive Haida Gwaii Cultural Center, and being invited guests of a Haida "potlatch" ceremony were episodes not soon forgotten! John and I joined early arrivers Bruce and Chuck, who had the misfortune of having to fly into Masset, rather than enjoy a 2-day, 21+ hour drive and a 7-hour ferry ride complete with "operational issues" that delayed our sailing until the next morning. Walt had warned us sternly about watching the highways for moose-- boulder-sized creatures that can easily cut a DXpedition (and a life) inconveniently short. Fortunately, all we saw were many dozens of the yellow and black moose warning signs along the way. Maps and globes label this chain of 200 islands as the "Queen Charlotte Islands," but it really should be Haida Gwaii, as the native people know it to be. The scenery is beautiful and starkly remote--you can see the Alaskan panhandle on the ocean's horizon from Walt and Wanda's Masset Island, BC summer home. The location is ideal for extended DXpeditioning, with easy access to the north-facing Pacific beach. We had room to run out Beverages, BOGs, terminated loops, and Wellbrook prototype arrays to our heart's content, although one antenna required major bushwacking by Bruce "Machete" Portzer. Safely at Walt and Wanda's special home on the beach, we began six straight days of DXing, fueled liberally by all manner of Haida native specialties. My plan of dining on Cup-O-Soups and Pop Tarts was quickly thwarted, as Wanda & company's ongoing menu included treats such as fresh-caught & smoked salmon, venison, red snapper, halibut, huckleberry pie, salal berry jam, and much more! With no local medium wave pests to speak of, the band was eerily quiet during the daytime; 930 Ketchikan and 860 Prince Rupert were the only stations of any significant strength. In fact, Ketchikan was our test station for adjusting the nulls on the Wellbrooks, since it is due north of Walt and Wanda's Masset home. Eat, sleep, DX... and repeat. That was the pattern of main activities for our six days in Masset. The DX we heard was fabulous, as the loggings will show. Most enjoyable for me was hearing 1548 kHz, Deutsche Welle in Sri Lanka, and the unexpected TAs from Holland, Algeria, UK, and even São Tome (!) were just gravy on the DX plate. 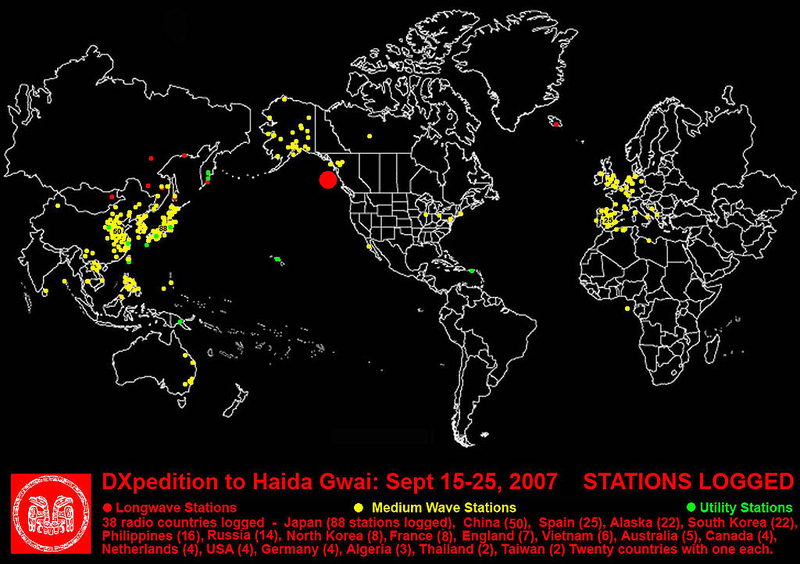 I logged a number of new Japanese MW outlets on 10 kHz frequencies simply due to the lack of local/regionals from remote Haida Gwaii. I know that from now on when I DXpedition from familiar Grayland, WA, I'll think of Masset on the Charlottes to the far north--where the band is quieter, the food far better, and the natives make you feel like a local! Walt and Wanda--thanks for opening up your hearts and home to us; it was a special time for all. 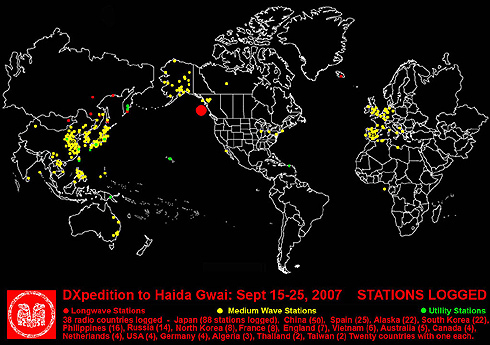 Few of my lasting memories of the DXpedition to Haida Gwaii are about the equipment we used or the DX we heard. That is probably because I've wanted to go to the Islands for almost half a century to visit the homeland of the fabulously artistic Haida nation. Like most of us, as a child, I was fascinated by totem poles and the startling graphic images that covered them. When I got into college and took courses in graphics (required for budding architects) I learned that many of the "tribes" or "nations" of the upper Northwest made totem poles and had similar stunning graphics; after a bit more reading I found out that the Haida nation had been the most successful at war and diplomacy, the best seagoing navigators and the best, the purest of ancient artisans. The Haida homeland was and is the very large Queen Charlotte Islands which lay almost 100 km. off the very northern coast of Canada's British Columbia; they insist on calling those home islands "Haida Gwaii." Walt Salmaniw's lovely wife Wanda is a Haida; they met when Walt served as the base surgeon at the then highly-secret joint Canada/USA radio monitoring station right outside Masset, on the northern coast of the Islands. When they invited several of us up to their new cottage on that same north coast of Haida Gwaii, we were all really excited. I was sure that it would be a double-barreled treat. First, we'd get a chance to DX on the coast a looooong way from most of the MW transmitters that bother us so much in the Victoria/Seattle/Portland areas; there was the added thrill, too, of DXing within two or three miles of one of those super-secret "Wullenweber Array" 1200 foot diameter listening antennas. If the governments were willing to put up hundreds of millions of dollars worth of listening antennas on the north shore of Haida Gwaii, the DX really oughta be great! Secondly, with Walt and Wanda both being local residents, during the DXpedition we would have a good chance to meet some of the artists, see their work and possibly understand a bit more of the unique Haida culture. As it turned out, we were more than rewarded on both counts: fabulous DX, almost too much for even five of us to adequately log and report and Haida hospitality, food, art and friendship that was equally bountiful. Its difficult to decide which of the DX catches were my favorites. Our most newsworthy catches were probably 1548 DW in Sri Lanka, 1530 VOA Sao Tome and 684-AIR Port Blair in the Andaman Islands; the former two were heard first by Chuck and Bruce, the latter by that wretch Walt, not 30 minutes after Guy and I, as the last two guests, left the cottage on Haida Gwaii. I think that we'll also likely never forget the trans-Arctic European openings for three or four evenings in the early part of the DXpedition. Apparently our trip to Haida Gwaii coincided with the best TAr opening of this solar cycle. For me, I heard more and better Europeans and North Africans in those three or four evenings than I heard in three DXpeditions to the Outer Banks of North Carolina with Harold Cones. Lastly, I'll not soon forget logging such a flood of Japanese stations. After twenty years of specializing in Japan, there were only a few that I had not heard at least once before, but those few are precious. And to hear so many so well in such a short time. Priceless! Finally, Guy Atkins and I chose to drive up to the Queen Charlottes rather than fly, as did the rest of the crew. We might have decided to drive before we realized just how long a trip we bargained for. British Columbia is VERY large. Guy and I drove a full twelve hours north through central BC to Prince George and then eight hours west to the Pacific coast at Prince Rupert. From there it was a 7 hour ferry ride and another hour plus drive to the Salmaniw's cottage on the north shore of Haida Gwaii. Guy and I would have had fun doing that road trip no matter the territory traveled through. However, British Columbia is stunningly beautiful and, especially on the trip back, the fall colors were simply gorgeous. Golden birch forests in the evening sun and high Alpine glaciers in the mists don't QSL, but they were certainly memorable, as well. I was able to hear NHK1 on 990 and 999 and they completed my goal of hearing each and every frequency on which NHK1 and NHK2 operate. That's a total of 40 frequencies for NHK1 and 23 for NHK2. 610 CKRW from the frozen Yukon (Whitehorse) was a target and was heard within a few minutes of tuning to 610. Almost too easy. The 810 LPRT (40 or 100 Watts - not sure) from Whitehorse was also heard when I noticed the oddity of French language weather. 1566 UK: This was the first TA I heard after plugging things up! I was making the first of many checks for India but instead heard a commercial English station which later was ID'ed as County Sound Radio by Bruce. 1548: It was a thrill to hear Sri Lanka with a decent signal since it's so far, far away. It would have been the catch of the trip had it not been heard once before. 1566: There were tantalizing pieces of something under HLAZ several times. Later I will have to study the recordings closely. 810: A surprise was the AFN station on 810 which is not widely heard. There were Filipinos on many frequencies. New stations included 1323 Nation Broadcasting, 1458 Bantay Radio, 1485, 1530, and more. Those were the nocturnal highlights. The daytime highlights were just as good, due to the magnificent setting of Walts cabin just off the beach in the forests of Haidi Gwaii (aka the Queen Charlotte Islands). There was also the great experience of watching Walt get inducted into the Haida nation as his wife is a Haida. Add it all up and this was a great experience, a great vacation, and a great DXpedition. This was by far my longest and most amazing DXpedition ever. For one thing, we were several hundred miles north of home, so there was a lot less interference. It was nice having only three stations within 100 miles of us. We had open water to the north of us and land to the south of us, which helped enhance reception of Trans-Pacific and Trans-Atlantic stations at the expense of stations to the south. The TAs were absolutely amazing at times. Some, such as Germany-1422 and France-1377 were often equal to and sometimes stronger than stations on neighboring domestic channels. I expected reception patterns to favor the higher latitude TAs, as is often the case in the Puget Sound region. Those stations were indeed present, but overall reception was similar to that reported by New England DXers, with plenty of signals from Spain, France, and North Africa. Some of my favorite logs for the week include County Sound Radio-1566 (750 watts), Capitol Gold in Manchester on 1458 (5kw), Spain-1485, Holland-1395 (aka Big L), Manx Radio-1368, and VOA Sao Tome on 1530 (mixing with KFBK). TP DX was likewise impressive. Many channels were dominated by the usual powerhouses we can hear at home or at Grayland. But with reduced interference from adjacent domestics, it was possible to hear them more clearly and hear others in the background. For example, DZEM-954 was noted mixing with JOKR one morning. The DX became much more impressive around 1400 UT, after most of the domestics had faded out. Some of the even channels were occupied by 3 or 4 TP stations. For example, once KGO faded out, China, North Korea, Russia, and AFN-Tokyo could be heard on 810. Similarly, I was able to log China Radio Internationals SE Asia service on 1080 mixing with the North Korean station and its South Korean jammer. Other noteworthy logs included KTWG-801, Changchun-1332, CRI stations on 1269 and 1296, and a relog of Sri Lanka 1548. I hope to identify a few more once I go back through the logs. DU stations were anemic  Tahiti-738 was there weakly a couple of times, as were a couple of the stronger Aussies. I didnt spend much time listening for domestic stations, but I did note three from east of the Mississippi: WBZ-1030, WTAM-1100, and WYLL-1160. This was also my first DXpedition with a software defined receiver, the RFSpace SDR-IQ. I made good use of the SDRs ability to record 190 kHz of spectrum, and filled my hard drive with 200 GB of recordings. Ill be spending the next few weeks listening to them as time permits. The SDR opened up all sorts of new DX possibilities, simply by recording large swaths of the band while I tuned around on the R8A. For example, the SDR captured a minute or so of readable audio from Manx Radio during one of those recording sessions; otherwise 1368 had only a routine het. I tuned past the channel many times in favor of more interesting stuff, and wouldnt have heard it except for the SDR recording. Like I said at the beginning, this was my most exciting DXpedition of all times. My thanks go out to Walt, his wife Wanda, and her family for all the wonderful food and good times. This years dxpedition will go down as one of my most enjoyable (and perhaps exhausting) dxpedition ever. Arriving during prime DX season, I immediately began dxing using an existing short 400 N/S Beverage from UTC September 15th. Upon the arrival of my first two guests, Bruce Portzer and Chuck Hutton on the 16th, we immediately proceeded in erecting a virtual DXers paradise with numerous antennae including BOGs, a Wellbrook phased array, a small corner fed loop, as well as the existing N/S wire. Conditions for the most part were wonderful, although deteriorating over time. My last morning, however, appeared to be as good as an Asian opening as Ive ever heard! John Bryant and Guy Atkins arrived on the afternoon of the 17th after a minor ferry delay, and jumped right into the serious dxing! Although quite cramped, we nonetheless were all quite comfortable, and enjoyed the sites and cuisine of Haida Gwaii. Personally, I was honoured by the Haida nation by being adopted as a Raven into my wifes aunts family. I was given the Haida name of nung cung guduny us meaning a kind person. It was a moving experience, and I was delighted to have four close friends from the dx world witness this event. Pictures from the DXpedition are available on the website of Guy Atkins, dial-up and broadband pages. 1485 SPAIN Sep 17 05:45 Lots of mentions of "Santa Rosa" with a good signal. Several Spanish stations listed here. See also addendum published on February 23, 2008!